This electric rice cooker from Bajaj Majesty is going to be your solutions to all your problems with food in your paying guest accommodation. You can now have the kind of rice you like and even prepare simple side dishes over the weekend. 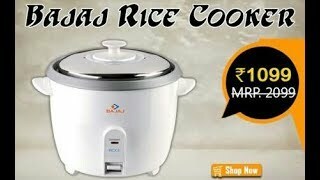 At flipkart.com you can purchase Bajaj Majesty RCX 5 Electric Rice Cooker(1.8 L, White) for only Rs. 1,349, which is 31% less than the cost in Infibeam (Rs. 1,944). The lowest price of Bajaj Majesty New RCX 5 Multifunction Cooker, white was obtained on April 19, 2019 11:39 am. I have received this product in 1 day with no problemsEverything is fine except automatic cooking / auto warm system — Either i am not able to operate or mentioned wrong in product description. It is not at all a good product. The item is taking a long time even boiling water after using 15 days.And now it is not eligible for return. A so much bad experience…..please do not buy this product. The automatic cut off does not work. You have to continuosly check the cooker whether rice is cooked or not. And it always gets stick at the bottom if you dont turn it off at the right time.. Don’t expect the cooker to cut off automatically. So my opinion is…DONT BUY IT. Ok product. Cooks nicely but text paint on body is diminishing with every passing day. I dont think it has warrm option because once food gets cooked and rice cooker is kept on it doesn’t keep food warm. Very bad experience with amazon. This product is totally irritating.There is no auto cut. Good to cook. I make chicken and mutton briyani in this. Smell and taste great.Negative side: heating slow. No automatic switch off. In between cooking you can check.Good for price. No fear of electric shock. Can cook for 5 to 6 adult at a time. Help full in travel.